IANDS has established the Diane Corcoran Bequest Society, "Gifts from Beyond the Light". This special fund has been aptly named in honor of Dr. Diane Corcoran, who has served IANDS so well in countless capacities over the years, most recently as President. This program gives our members and friends the ability to leave a lasting legacy to IANDS through a bequest, a will, or an estate plan. Your generosity will ensure that the IANDS mission is carried on far beyond the life span of any one of us. You can become a member simply by remembering IANDS in your will or estate plan, adding a codicil (remembering IANDS) to your current will, or naming IANDS as a beneficiary of your life insurance policy or annuity. Then simply inform the IANDS office of your intention (no need to specify amounts) via mail, e-mail, or phone . If you have always held IANDS near and dear to your hearts, we respectfully ask you to remember IANDS when you are planning your will or estate plan---and become a member of the Diane Corcoran Bequest Society. You do not need to rewrite your current documents; simply add a codicil to your will or living trust. 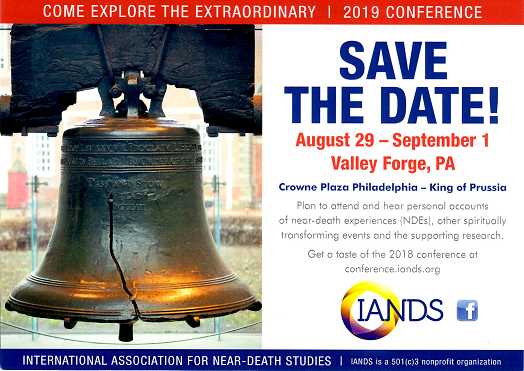 Consider this suggested language with your attorney: "I devise and bequeath to the International Association for Near-Death Studies (tax ID 06-1050150), located at 2741 Campus Walk Ave, Building 500, Durham, NC 27705-8878, the sum of __________________ dollars ($_____________), or state a percentage of your estate, or describe real or personal property (including the exact location)." YOUR THOUGHTFULNESS AND PLANNING TODAY WILL HELP TO ENSURE THAT THE IANDS LEGACY REMAINS VITAL AND SECURE FOR GENERATIONS TO COME!! Inaugural Bequest Society Tea: The founding members of the Diane Corcoran Bequest Society were honored with a tea at the 2011 IANDS Conference in Durham, NC. Seated: Pat and Paul Fenske. Standing, left to right: Lisa Yesse, Diane Corcoran, Rhonda Bailey, Lee Witting, Robert Mays, Suzanne Mays and Alexa Hartung.